The Amarillo Sod Poodles, Double-A affiliate of the San Diego Padres, have released 2019 general game day parking information. 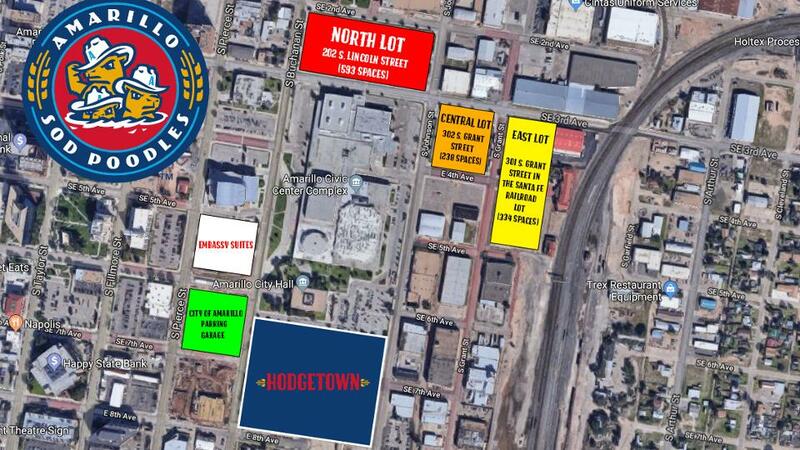 All fans will have the option to park in three different team-controlled paid lots on a nightly basis for Sod Poodles home games. A North lot, located at 202 S. Lincoln Street (593 spaces), Central lot, located at 302 S. Grant Street (238 spaces), and East lot, located at 301 S. Grant Street in the Santa Fe Railroad lot (334 spaces) will be controlled by the team. Each of these lots will cost $5 per car upon entry (cash and credit card accepted). The three team-controlled parking lots (North, Central, and East) will open on game days 90 minutes before first pitch. Gates at the downtown ballpark open one hour before first pitch except for Opening Night (April 8) and July 4 when gates will open two hours before first pitch. Additional parking can be found in downtown Amarillo in the city's Parking Garage. Parking Garage access is $7 per car and is paid upon entry with easy-flow exit. There are 20 handicap parking spaces available in front of City Hall and in the Parking Garage. There are also handicap parking spaces available in all of the other city-owned parking lots with accessible routes to the North and South side entrances of the downtown ballpark. There will be no charge for parking of vehicles with handicap plaques or plates per Texas Law. Parking can also be found around downtown and in privately-controlled lots as well as along Buchanan and other streets. Street parking in downtown is available for free Monday through Friday after 5:00 p.m. and on weekends. According to the City of Amarillo, there are a total of 7,256 public, private and city-owned parking spaces within a 1600-foot radius of the downtown ballpark. For additional information on parking, please email info@sodpoodles.com or call 806-803-7762. The Sod Poodles open the 2019 regular season on Monday, April 8 at 7:05 p.m. against the Midland RockHounds.